Ships, lifeboats and the Coastguard helicopter are continuing their search for a fishing boat and its three-man crew missing without trace off Dorset. 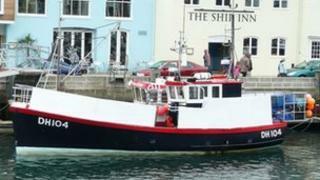 The boat, the Purbeck Isle, was reported missing at about 18:00 BST when it failed to return to Weymouth. Fred Caygill of the Maritime and Coastguard Agency (MCA) said: "We will continue to endeavour to keep going with the search." An extensive search overnight included HMS York and a US Navy supply vessel. The search has resumed with the RNLI lifeboat, Coastguard helicopter and a commercial survey vessel using its sonar equipment. Mr Caygill said: "It's a vast search area off Portland within the periphery of Lyme Bay, searching the usual fishing grounds and where the Purbeck Isle usually lays its pots, but that search area is expanding." The alarm was raised for the 11m (36ft) boat and its crew by a fellow fisherman who was unable to make radio contact with the vessel. Andy Alcock, secretary of the Weymouth and Portland Fisherman and Licensed Boatman Association, said: "It's come as a shock to everyone within the port. "At the moment we are still hopeful. Weather conditions were reasonable - there is a liferaft on board so they could be up or down the channel somewhere." The crew of the boat was rescued in January 2011 after the vessel began taking on water off Chesil Beach, west of Portland.